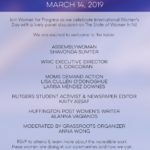 Women for Progress aims to raise awareness, educate and connect individuals to activism on a wide range of issues including gender equality, gun violence prevention, environmental protection, racial justice and human rights. Join Women for Progress as we celebrate Earth Month with an informative panel discussion on the connection between chemical exposure and our health. 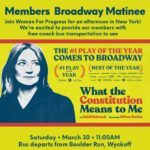 Women For Progress Goes To Broadway! Senator Cory Booker and New Jersey’s First Lady Tammy Murphy congratulate Women for Progress on their one year anniversary. The Bergen Chapter of the Brady Campaign is proud of our partnership with Women for Progress. We look forward to working together toward the common goal of eliminating gun violence from the lives of our citizens, locally, nationally and worldwide. 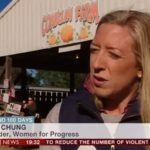 What makes Women for Progress such a special organization is how they’ve galvanized a community of women in a short amount of time, that eagerly come together at events that are learning and action-oriented. WFP understands the desire for change that the women in their group have, and they wisely use that knowledge to help move their causes forward. In turn, they are empowering these women to listen to their own inner voice, speak truth to power, and help shape that deep desire to do more, into real action. Now is the time for women to stand up and have their voices heard. Women for Progress is lighting the way - engaging us to make a difference and ensuring that our collective energies impact our community. 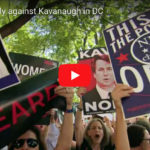 The political climate today requires activism by organizations such as Women for Progress who will lend their time and voice to "Calling Out" injustices targeted towards individual freedoms. 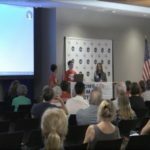 Women for Progress provides reliable facts from reputable leaders and expedient outreach to champion women to get engaged.